Somewhere In Time XII – The Future Is Now! 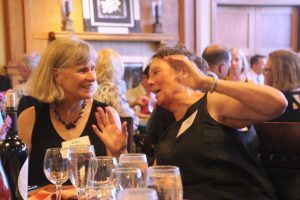 CLCF’s Somewhere In Time XII was a delightful party, a record-setting success, and an exciting springboard to future goals. 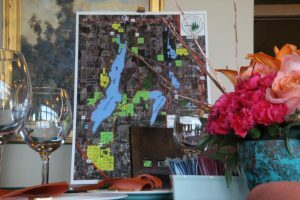 Over 200 supporters from Little Cedar Lake, Silver Lake, Big Cedar Lake and other places in the Cedar Lakes watershed gathered at the West Bend Country Club on Saturday, June 30th to meet and support the mission to conserve the natural environment of this unique and special place. 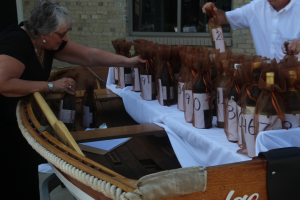 The West Bend Country Club patio was a perfect setting to get the evening started while enjoying the view of rolling glacial hills and woods, a jazz combo from Brew City Big Band, a smorgasbord of silent auction items and hors d’oeuvres paired with wines, and a literal boatload of wine bottles at the Wine Pull. During dinner, our photographer went from table to table taking group portraits. These group photos are posted on the Cedar Lakes Conservation Foundation Facebook Page. 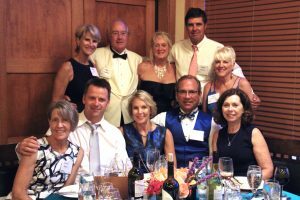 The fundraising focus of the evening culminated in a Raise the Paddle challenge with donations up to $200,000 being matched by the Thomas J. Rolfs Family Foundation for land acquisition. The Raise the Paddle resulted in pledges of over $260,000. With the matching grant from the Thomas J. Rolfs Family Foundation, this brings the total for the Raise the Paddle portion of the evening to over $460,000. These funds are designated for the recent purchase of a former part of Ackerman’s Grove County Park, which is known as the Thoma parcel, and for other land acquisition. Total net proceeds for the event, including the Raise the Paddle, were over $587,000, which will help CLCF continue to protect the natural environment of the Cedar Lakes region. After the auction, the Brew City Big Band helped us celebrate our success with some energetic dancing, topping off an incredibly productive evening with great music and socializing. CLCF is overwhelmed and grateful for the generosity of our members and guests and by the committed support of our volunteers. 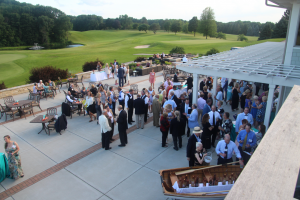 Special thanks to our Committee Chairs, Mary Beth & Buzz Carr, the committee members, event sponsors, event volunteers, auction item donors, Cedar Lake Yacht Club youth volunteers, West Bend Country Club and so many others who made this a memorably outstanding occasion.